At this point, I think we can all safely ignore news sources that tell us that the celebrity fragrance trend is over, no? And clearly, the days when a little personal trouble might hurt a celebrity's market appeal are long gone; on the contrary, one might assume the more trouble the better — Paris Hilton, I suppose, qualifies as Exhibit A, although Britney Spears has certainly given her a run for the money (pardon the pun). Given that my expectations were low, I was pleasantly surprised. I wouldn't go so far as to say that I like it, but I don't hate it, and if given the choice between this and say, Miss Dior Cherie, I would pick Fantasy. At the time, I was just starting to explore celebrity fragrances; now that I've tried most of what's been released over the past few years, I'll qualify the above by noting that Fantasy is considerably better than much of the competition. Midnight Fantasy, not so much — it reminds me of grape Kool-Aid, and not in a good way (although offhand, I can't think of a good way that something could remind me of grape Kool-Aid). When the grape Kool-Aid fades, little of interest is left behind. I found the dry down bland. Mind you, not everyone agrees with me; Midnight Fantasy has lots of fans, and at the moment, it has a higher rating on MakeupAlley than the original Fantasy. 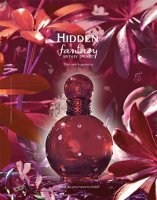 The recipe for the new Hidden Fantasy is pretty much standard for a celebrity fragrance geared towards the youth market: fruit, more fruit, sugar, sheer nondescript floral notes, vanilla sugar, pale woody musk. In this case, they've gone with the Blastin' Berry Cherry Kool-Aid for the top notes, and they've cut it (thankfully) with lots and lots of tart citrus (the notes: sweet orange, tangerine, grapefruit blossom, verbena, jasmine, stargazer lily, sweet Napolitano cake, vanilla bean, jacaranda wood, fluid sandalwood and amber). I can't really say I like it, but I find it considerably more palatable than the opening of Midnight Fantasy. Then we've got the "flowers", followed by Fantasy's warm vanilla cupcakes, here given a twist by a touch of cherry almond flavoring. The lasting power is very good, and in contrast to Midnight Fantasy, Hidden Fantasy's personality doesn't evaporate with the top notes. Hidden Fantasy is fine, and while it's not to my taste, I'll be surprised if it doesn't do very well. For my part, I like Fantasy better, and I like Britney's Believe even better still. For that matter, if I were after young, fun, fruity, trendy and new, I'd skip Britney Spears altogether and go with Ed Hardy's new Love & Luck. Britney Spears Hidden Fantasy was developed by perfumer Rodrigo-Flores Roux. It has not yet officially launched, but it can be found at Kohls brick 'n mortar stores. It is available in in 30, 50 and 100 ml Eau de Parfum. sounds great can't wait to smell it! im so glad u liked it kinda! definately better then midnight! it just has way more personality then midnight. the citrus' on top are my favorite part of the scent! its like an orange creamsicale to me! while i adore hidden fantasy ure absolutely right that it doesnt beat the original fantasy! ure right again that fantasy is far better then the competition in recent yrs. i enjoy all of her scents and i hope she keeps them comin for yrs and yrs to come! It's funny – when I was a kid, I loved florals, but never fruit. And brandy-amber scents (hence my obsession with Wind Song). I wonder if most of the youth market likes these candy-like smells, or if it's just what they are used to? Robin, you are doing some rough work here! Let me ask your opinion: don't you think those bottles are ugly? I mean, each one, in its own meh way. I get that I am not a target for the juice, but I find nothing in that bottle that cries out to me either. I think it looks …. dumpy? However, now you've got me wanting to try it! Yes, she is doing some heavy lifting here. “Blastin' Berry Cherry Kool-Aid” and “warm vanilla cupcakes” – that is some serious sweetness. I have a feeling you will get your wish — Elizabeth Arden is likely to keep making these for some time yet! Bet we'll see another Britney scent before the year is out. It's a good chicken vs. egg question — they certainly weren't in style when I was young, but then, when I was young, young people didn't have so much ready cash as they do now, so nobody was marketing to 13 year olds. So far, recent trends in fragrance do not seem to have trickled down to the “young celebrity” market, which is still mostly doing about the same sort of thing it was doing 5 years ago. M, I pretty much hate the bottles. If I had to have one, I'd take the blue one for Midnight Fantasy I guess. I thought the Believe bottle was much better, but maybe that one was too simple & bling-free for the target audience? It's pretty darned sweet, but even then I'd guess it isn't as sweet as Jessica Simpson Fancy, and in the end I liked Fancy better than Hidden Fantasy. I love the Believe bottle, and it smells amazing! I even liked the outer box — just looked classier than the Fantasy packaging. I got some through a very kind reader. I do understand it's at Kohls, and would think Macy's would have it soon. As of this morning though, it was not yet on the Britney Spears or Elizabeth Arden websites. Sears in Canada has Hidden Fantasy and the rep for Arden says that there probably won't be any samples which is not good. But I think the fragrance will do pretty good. Midnight Fantasy always flies out of our store but it should when the 30ml spray is only 19.99 everyday. You know, while I found Givenchy's new “Absolutely Irresistible” pleasant enough, there was an unusual kind of kool-aid-berry opening, very tart and “Jolly Rancher” sweet—but not like that of many modern fruity-florals that I've come to recognize (caramel, vanilla-cake and rasberries in an aquatic wash). I wonder if this is going to be a new trend. Perhaps the flavor companies have recently developed a blend that's economical and many houses “bought it up” for the season. Hmmm… this review is making me want to go back and try Believe again. I love the bottle for it and I bought it on super clearance after Christmas (unsniffed), but didn't care for the juice. There was something about the opening notes that was just off for me, it was almost too “sharp”. Now I wonder if I was just in an odd mood that day or my chemistry was off. I liked the original Fantasy through the opening and heart notes, but it dried down kind of sickeningly sweet for me – which is odd because I actually like Pink Sugar as a comfort scent. That makes me wonder if Hidden Fantasy will be too sweet as well or if it's lightened up enough to be nicer. I'll have to give it a sniff, but I can't believe that there won't be samples? I suppose they're counting on the target market buying it no matter what? Go to blogware.com, sign in at the top of the page and you can alter your profile. I don't know, but berries sure are everywhere lately — even in niche. Guessing this will be too sweet for you too, but I suppose it's worth a shot. Assuming it's coming to Macy's there will at least be testers, hopefully. I don't love Believe either — just think it's the best the line has done before. oh i'm surprised she's doing her own perfume after advertising True star and Diamonds…it gets confusing! I love her though and I think that Coty do the celebrity ones well. I think Elizabeth Arden will be my favourite for a while, what with M, With love and of course the Britney line! It worked! (I Hope). Thanks Robin! I'm kinda worried Hidden Fantasy won't come to Macy's :(. When I went to Kohl's I saw Live Platinum there also and that one isn't going to Macy's either. Live Platinum kinda reminds me of Daisy. Is it confirmed HF will come to real department stores? I sniffed it and to be honest, i was a little disappointed. It's not bad, it's not bad at all, but there's nothing special about it either. And after a while it smells a lot like original Fantasy on my skin (I like Midnight Fantasy more). When I first heard about it I was really excited and looking forward to it. Probably I was expecting something different, something more reddish (cherries maybe?). Love the bottle though. Too bad — maybe her next one will be better. Just tested this today: It wasn't what I expected, but I really like it. I'll have a few more trys, but I think I'll get this. I didn’t find this to be a sweet fragrance; on me it was mildly spicy. There was a hint of vanilla in the drydown, but I only thought it gave a bit of warmth to the fragrance. I think this is the first entry in the Fantasy line that could be classed as an ‘adult’ scent. We had nearly opposite reactions — I would have said Fantasy (the original) was the most “grown up” of the range. Glad you love it! i just found it on elizabetharden.com and ulta.com! i purchased me the 3.3oz bottle! im so excited! i cant wait to get it! Oh good, thanks for letting me know — and hope you'll love your bottle! where did you see it?! My local Boots (UK) had it in stock. Thanks. I want to go and get it today but will have some patience and get it tomorrow instead, lol. got mine today and actually think it's more grown uo than the others (although as iv said many a time, I love them all). put it this way, I'd happily where this 'fantasy' to work but perhaps not the original at the mo. Thanks for the update! Glad your daughter loves it, at least. i finally got my bottle in the mail. that said my collection is now 30+ fragrances and im wondering robin, how long do fragrances typically last in their bottles without turning weird and ugly? i hope to be able to have my collection for a long time without them going bad. ive never gotten a staight answer beacuse so many people, places, and websites say different things. You've probably never gotten a straight answer because there is no “one answer” that covers all perfumes. Some perfumes last years upon years, others don't…and you can't know which are which, and it has nothing to do with the quality of the perfume. Many websites will say “1 year” or some other specific time period, but that's nonsense. I've got perfumes that are 10 years old and doing beautifully, and I've had perfumes “turn” in as little as 9 months. The best you can do is keep them in a cool, dark (very dark!) place like a closet or cabinet or drawer, and hope for the best. thank you very much. yeah my oldest is 5 yrs old and its doing just find. i keep them all hidden in the dark under my bed. so im hoping for the best and that theyll out live me. lol. by the way i just wanted to tell you that i just recieved hypnotic posion in the mail. i loved your review so much that i bought it without trying it first. i absolutely love it!!! i just had a question, with the poison bottles, does the perfume(liquid) not actually reach the top of the bottle when its new? because it wasnt all the way at the top but just above half? i also bought sira des indes from your review. another winner for me! thanks! i hope to get midnight posion next! Gosh — they're rarely filled all the way to the top, but only half full sounds like a problem to me. I'd contact the seller. Thats how I would rank them if I sniffed them w/ out actually focusing on the notes….Pretty good stuff if ur into sweets…. This is the most terrible scent I've ever smelled. I thought I would love it because I love all of Britney's fragrances (especially fantasy and midnight fantasy), but this one was sickening. It smells like a mixture of citrus pet deoderizers, the pepper spices that are kept in a pepper spice shaker at pizza places, along with the scent of men's shaving cream. The bottle is really cute, but I just can't stomach the scent of it. Haha (= Dont get your hopes up, y'all. Britney really screwed up this time around. I somewhat like it but I also detect that spicy clove (pale) note in it…. It starts of very orangey doesn't it? Kristin, it's all a matter of taste — I thought this one was miles better than Midnight Fantasy. I love the bottle though…. hope they keep bringing out Britney perfumes!!! Funny but I like Miss Dior Cherie, though I shouldn’t, I suppose, as I generally dislike fruity fragrance. However, the fresh strawberry hits me the right way, and the patchouli dry-down isn’t bad. I’ll avoid Britney’s ouvre like the plague out of pure snobbishness, but I’ll confess that once I went to pick up my laundry and the girl behind the counter smelled very good indeed and I asked what she was wearing and she said, “Fantasy.” So there it is. Fantasy was very well done…and still better than many other vanilla cake celebrity scents! Yay! My hidden Fantasy came today, and they sent me TWO 3.3 bottles! seriously the flankers have to stop britney!!!! just saw it at macys today. im glad its getting a wider distribution in stores. i thought they gave up on her. the lady said its doing very well so being a huge britney fan im glad her perfumes are still hot sellers ! GO BRiT! i hope she comes out with a mens one someday. She has another one coming this year, but don’t know when. really! how exciting! i love how ure always in the know! thanks! LOL…I feel like it’s the opposite, like you guys are always telling me what’s coming next! But Elizabeth Arden has said there would be new scents this year from Britney, Mariah Carey & Usher. sounds great. thanks again and keep up the good work! ure reviewing is awesome! i wish i could detect all the notes that ure able to! Once I’ve tried it out of curiosity and my god.. I felt like I ate a jar of fruity & very sweet jam which in my stomach went soure and became the extra soapy scent. I had to wash it on the first opportunity. So i think i just found Britneys new perfume!!! Its going to be called Circus Fantasy!!! Im really loving eveything about it, the bottle, color, and notes, so im hoping its the real deal! its at britneyspears.hollywood.com! O im so excited!!! I love the whole circus theme and the tour was just AMAZING so i really cant wait! I wonder if it’s real? A floriental floral fragrance that combines delicious fruits, tempting floral essences and creamy musks that capture the magical atmosphere of the show Circus with a colourful illusion of fun, sensuality and glamour. Circus Fantasy is now available for Pre-Order on Elizabeth Arden’s website, y’all :). I hope when I wake up Forever is available also :). I’ll be pissed if it isn’t! Huge thanks, just posted it! Did not see Forever there yet. This one is probably Britney’s most mature smelling scent. It has a lot of depth from sweet, teasing orange top notes to a beautiful woody signature. Perfect for evening, I think. Mesmerizingly memorable! I was scared to smell this perfume at first, considering I am not the biggest fan of citrus smelling perfumes. However i chose to finally man up and smell it, smells like oranges and vanilla, if you like that combo together smells a lot like MF the only difference is this smell like they added citrus to it. Still sweet, but more mature. Its okay smelling I would NOT buy this perfume unless you fall absolutely in love with it. I would recommend the original fantasy if you’re looking for something smelling super sugary and sweet hope that helped!